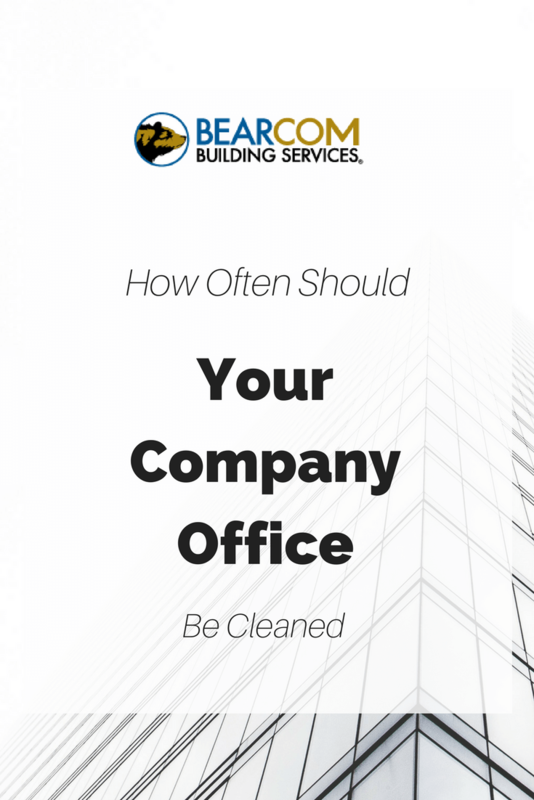 How often should your company office be cleaned to help your company? How Often Should Your Office Be Cleaned? Keeping a clean office is good for your employees’ productivity, looks great to your clients and is a good practice for your company overall. How often it should be cleaned is a good question, especially if you are thinking about bringing on a commercial cleaning service. Our experts have put together 3 main factors that will determine how often your company office should be cleaned. The bigger the building the more frequent the cleanings should be and vice-versa. The square footage of your company building will be the biggest impact on cleaning frequency and is the first thing to mention when contacting a cleaning service for a quote. With a large building, since there will be more surface area to cover, it would likely need a cleaning schedule that occurs more than one time a week in order to ensure the entire building is serviced. The team of cleaners will also more than likely be bigger. Some businesses or services create more mess than others. A law firm versus a children’s school, for example, would need less cleaning. The children’s school would need a daily custodial service to ensure it is in a sanitary condition by the next morning where as the law firm might need a bi-weekly or weekly service depending on the size. Also, businesses that require highly sanitized conditions, like a food production company, where cross-contamination can result in serious consequences for consumers, would need to have the highest frequency of cleaning services. Do your employees use the break room or their desks for lunch or do they leave the building? Are the hours longer where employees may also eat their dinner in their office and are clients entertained with food at your office space? The use of food services in an office area will result in the need for more frequent cleaning as spills, crumbs and sticky fingers will all result in a grimy workspace much faster not to mention, the growth bacteria from food sources will also be higher. In addition to food, if you have a lot of employees that results in high foot traffic, like some manufacturing companies, then the need for cleaning may be greater. High foot traffic will bring in outside contamination, dust, dirt, mud, and allergens will be much common if there is a higher volume of people coming and going. These three factors should be taken into account before contacting a cleaning service. Once the size and use of your building are established, the team of professionals will have a better understanding of your office space and will be able to suggest a schedule that fits your needs. How often your building should be cleaned will be based on the experience of the cleaning service and the needs of your business. For more information contact BearCom services today and let us help you with your cleaning schedule.